Read Part II of this series, All the News that Fits: Ideologically Skewed Coverage of Immigration at the New York Times. Jerry Kammer, a senior research fellow at CIS, won many awards in his 30 years as a journalist. In 2006 he received a Pulitzer Prize and the George Polk Award for his work in helping uncover the bribery scandal whose central figure was Rep. Randy "Duke" Cunningham. His work in Mexico for the Arizona Republic was honored with the 1989 Robert F. Kennedy Award for humanitarian journalism. In 2006, as marching protesters filled the streets of Los Angeles to demand rights for illegal immigrants, the New York Times published an editorial that glowed with approval. The editorial went on to declare that "[t]he marchers recognize — as much of the nation seems not to — the urgency of comprehensive immigration reform to the nation's future. Their indignation is mixed with pride in their work and hunger for fair treatment." The editorial omitted an inconvenient fact, one that was important enough to be included by other newspapers, including the Los Angeles Times, the Orange County Register, and the Long Beach Press-Telegram. As the Los Angeles Times reported, the marchers stood "amid a sea of American and Mexican flags. "2 The Mexican flags didn't make it into the New York Times. Neither did the flags of Guatemala, El Salvador, and Honduras, which were also abundant in the streets. The omission made the New York Times editorial a better fit for its civic vision. The editorial board at a newspaper whose front page declares its commitment to "all the news that's fit to print" was blind to evidence that didn't fit its bias. That bias is founded in the New York Times's determined advocacy for the tolerance and inclusiveness that are essential in a pluralistic, democratic society. But the Times has carried its good intentions to a destructive extreme. Its editorials have poisoned the national discussion of a complex and emotional issue. The Times has rejected the consensus-building moderation that used to characterize the policy prescriptions it presented on its editorial page.In the 1980s the liberal political philosophy that has long characterized that page was tempered by recognition of the risks of mass illegal immigration, particularly of unskilled persons who work in low-paying jobs. The nuance, moderation, and long-term perspective of those editorials helped to build the national consensus for the 1986 legislation. But the feared backlash came anyway because IRCA failed in its promise to combine a one-time-only amnesty with worksite enforcement that would stop future illegal immigration. While the amnesty went ahead, enforcement was reduced to farce. Workers with easily obtainable bogus documents pretended to be legal, and employers pretended to believe them. Instead of containing illegal immigration, IRCA became the engine of its roaring expansion as many who received amnesty moved across the country and established networks that attracted millions more who came illegally. Far from seeking to turn the illegal tide, the Times welcomes it, defends it, and encourages it. Rather than advocating compromise on immigration policy, the Times stokes confrontation. Adding insult to injury, it attacks the character of those who disagree. This claim to see evil motivations among those it criticizes is the flip side of the editorial page's ability not to see non-American flags waved by those it supports. It is a familiar trope at the Times. This stridency matters because the Times represents the pinnacle of American journalism. Its editorials are followed by engaged citizens across the political spectrum, as the paper's first public editor, Daniel Okrent observed in 2004. Following up on Okrent's point, it is important to note that viewpoints on immigration policy do not lend themselves to neat ideological distribution. Both principal sides — those who want expansive immigration policy and those who want to limit it — offer an eclectic mix of participants. While the Times's support for expansive immigration draws on the classic liberal concern for the vulnerable, its policy preferences are close to those of the libertarian Wall Street Journal. The Journal calls for open borders as it professes belief in "capitalism, free markets, and free people. "12 Ethnic lobby groups, church organizations, and some labor organizations join its list of allies, along with employer groups like the National Association of Manufacturers and the U.S. Chamber of Commerce. Meanwhile, those who favor more restrictive immigration policies include social conservatives concerned about national cohesion and the rule of law as well as liberals who warn about wage competition with American workers and environmentalists concerned about population growth. Restrictionists, meanwhile, are hounded by their association — whether direct or remote — with their own version of lesser lights, particularly those whose vehement views are truly nativist and bigoted and destructive of civil debate. Rosenthal, who was the editorial page editor from 1986 to 1993, observed that editorials reflect the zeitgeist. "They are a function of their times," he said in a 2012 interview. He added that IRCA was forged "at a time when the public understood, as it seems not to understand now, that you need compromise." That is certainly true. But the Times has compounded the problem, hardening battle lines on the left. Its positions have become so rigid that they undermine efforts to reach a compromise as destructively as those who denounce all proposals to legalize illegal immigrants as abject surrender to lawbreakers. The driving force for this transformation of the most important American newspaper from moderate and reasoned to hard-line and intemperate is not hard to locate. It can be found at the top of the Times masthead. On that lofty perch one name occupies a line all its own. It is the name of the man who became publisher in 1992 and declared his determination to shake up the editorial page because he thought it was too moderate and lacking in the passion and moral certitude he preferred. That man is Arthur O. Sulzberger, Jr. As publisher he sets the Times's editorial course on important policy issues. The editorial page is his voice. 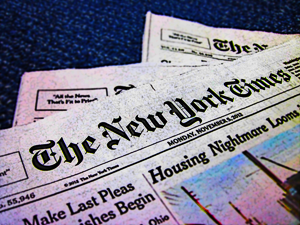 The story of how Arthur Sulzberger became publisher of the New York Times is straightforward. He inherited the job from his father. He continued a line of succession begun by his great grandfather, Adolph Simon Ochs, who bought the paper in 1896. The story of how he became the man who radicalized the paper's editorial page — especially on immigration — is far more complex and interesting. Like many in his generation, Sulzberger protested against the Vietnam War. Years later he said he hadn't worked on the Tufts student newspaper because "we had a war to stop. "19 He was arrested twice for civil disobedience. His father was so concerned by the second episode that he came up from New York for a visit. Their meeting revealed the depth of the young man's dissent. As they walked through Boston Common, Times publisher and Marine Corps veteran Arthur Ochs Sulzberger Sr. asked his son this question: "If a young American soldier comes upon a North Vietnamese soldier, which would you want to see get shot?" A 2009 Vanity Fair article by journalist Mark Bowden provided another look at Sulzberger's inclination to absolutism.22 Bowden wrote that in Sulzberger's office was a framed World War II quotation from Winston Churchill: "Never never never give up." Bowden noted, however, that is not what Churchill said. What Churchill actually told the British people was: "Never give in, never give in, never, never, never, never — in nothing, great or small, large or petty — never give in." But Bowden reported that Churchill added a qualifier to his call for heroic defiance. The British people should never give in, Churchill said, "except to convictions of honor and good sense." In the Sulzberger era, there would be no room for qualifiers of the paper's advocacy for expansive immigration policy. It would disavow the nuance of the 1980s editorials. "You weren't supposed to be graduating into a world where we are still fighting for fundamental human rights, whether it's the rights of immigrants to start a new life; or the rights of gays to marry; or the rights of women to choose," Sulzberger told the graduates. He said fateful decisions lay before them. "You will choose at each point whether to be bold or hesitant, inclusive or elitist, generous or stingy." Sulzberger's most sacred value is inclusiveness. For him it is synonymous with diversity, which more than two decades ago he called "the single most important issue" facing the Times.24 He is committed to using his position to be the champion of those who have felt the sting of discrimination, whether because of their race, gender, sexual orientation, or immigration status. This is a fundamentally admirable value that he has taken to an extreme with Times editorials on U.S. immigration policy. That policy affects the ambitions of tens of millions of people who yearn for the world's most coveted document: a green card conveying the right to permanent residence in the United States. Sulzberger’s politics tend to be uncompromising. But his lifestyle shows flexibility in reconciling his populist politics with his appreciation of the good life provided by the Sulzberger name. While the radical new spirit thrilled Sulzberger, it offended the pride of some editorial page alumni. Max Frankel, who had edited the editorial page from 1977 to 1986, struck back in a 1999 memoir. Frankel disputed the notion that he had been too even-handed, and that the editorials had taken on a tedious "on the one-hand, and on the other" quality. Twenty-one years after Times editorials helped build support for the compromise that IRCA was supposed to represent, they played a far different role in the Senate's 2007 battle over comprehensive immigration reform. David Brooks wrote about the antagonisms in the national debate. As an op-ed columnist at the Times, Brooks is an independent voice not bound to support the biases of the editorial page. Perhaps out of deference to colleagues, he didn't mention the page as one of the most aggressive participants in the ideological battle. Brooks's column echoed a concern expressed years earlier by John Higham, the dean of American immigration scholars and the author of the classic 1955 study of nativism, Strangers in the Land. Such cautionary notes are no longer played on the editorial page of Arthur Sulzberger's Times. The comprehensive immigration reform package that came to the Senate floor in 2007 was a 761-page legislative behemoth. Like the 1986 act, it was balanced on a compromise. This time it paired a sweeping amnesty with a provision to redesign legal immigration so that it was based more on skill and less on family connections. The Times loved the legalization part as ardently as it hated the other end of the deal. Endorsing the legalization proposal, the Times declared: "It is the nation's duty to welcome immigrants, to treat them decently and give them the opportunity to assimilate. "48 Once again, the Times did not qualify the imperative to welcome immigrants by distinguishing between those who come legally and those who come illegally. It was not a revolutionary concept. It already was the policy in Canada, Australia, and Britain. But at the editorial page, the plan was repugnant because it failed to serve the highest value: inclusiveness for the world's poor and unskilled. The Times demanded that the current system of legal immigration not be reformed, that it continue to offer green cards not just to individual immigrants and their immediate families, but also to their extended families in ever-lengthening links of in-laws and cousins known as "chain migration." It drew a hard line: "The deal should be improved. If it is not, it should be rejected as worse than a bad status quo." In the summer of 2007, the compromise unraveled. There was a furious uproar against legalization. Much of the opposition was based on a reasonable concern that the bill would repeat the failure of the 1986 act. Some of the concern, especially what emanated from talk radio, was an ugly expression of xenophobic hostility. But once again, the Times showed no sense of the inclination to compromise that made it a constructive force in the 1980s. It saw the opposition as tub-thumping bigots. It decried "the ferocity of the opposition from the restrictionist right, with talk radio lighting up over 'amnesty', callers spitting out the words with all the hate they can pour into it. "54 The verdict for those who wanted to restrict immigration was clear — guilty by association. There were other reasons for the failure of the 2007 "comprehensive immigration reform" effort. The Times's extremism showed itself during the uproar over a provision for hundreds of thousands of low-wage guest workers every year. Arthur Sulzberger's convictions on immigration policy have found their passionate voice in Lawrence Downes. Combining commitment to the cause with a talent for graceful prose, Downes has written or helped write dozens of unsigned immigration editorials since he joined the Times editorial board in 2004. He has also penned many personalized "editorial observer" columns, which combine opinion with on-the-ground reporting. While Downes brought no immigration expertise to the board, he came with great empathy for those who face rejection because of their illegal status. He also identified with those whose feel marginalized by mainstream society for reasons of ethnicity. Himself of mixed heritage — his maternal grandparents were Okinawan and his father a Caucasian from New York — Downes has written movingly about the about the complexity of being mixed race —"hapa" — in Hawaii, where he grew up. A former copy editor and projects editor at the Times, Downes joined the editorial board in 2004. Gail Collins was then the editorial page editor. She had succeeded Howell Raines in 2001 when Raines became the paper's executive editor. Collins, in turn, was succeeded in 2007 by the current editorial page editor, Andrew Rosenthal, son of legendary Times executive editor Abe Rosenthal. Rosenthal presides over the regular meetings — usually three times a week — of the editorial board. The board, which consists of more than a dozen journalists who specialize in various areas of public policy, chooses the editorial topics. Then the task of writing the editorial is assigned, generally to one member of the board, but occasionally to more. On immigration Downes is the go-to guy. His most passionate cause is the defense of illegal immigrants. He is their defender and advocate. He is the voice of Arthur Sulzberger. He added that a group protesting arrests of illegal immigrants in California "looked like poor people marching for a better life, the kind we root for in movies like 'The Grapes of Wrath.'" Advocacy for the underdog is an honorable tradition of American journalism, and Downes deserves respect for his assertion of the human dignity of those he prefers to call "unauthorized." Those who cheat them, exploiting their fear of deportation, deserve not just public condemnation but prosecution in a court of law. But when the Times takes the position that "the country cannot live without immigrant labor — no matter what the nativists may claim,"62 it is necessary to ask: how many, and by what criteria, and at what cost to American workers? When advocacy for illegal immigrants is as unconstrained as it has become at the New York Times editorial page, when it gives scant attention to the strains and costs that so many poorly educated and unskilled people inevitably impose on a society, when it shows great respect for the predicament of illegal immigrants while insulting restrictionists as nativists and racists, it undermines the prospects of reaching a workable compromise on immigration reform. Downes's refusal to acknowledge that there are legitimate, non-nativist reasons for opposing illegal immigration would be astonishing at a great newspaper if it were not so consistent with the views of a publisher devoted to unconstrained inclusiveness. A 2011 editorial said Arizona has become the "ground zero for a new nativism" with its strict laws against illegal immigration.64 But the editorial page has never noted the remarkable intensity of the illegal influx. Between 199065 and 200866 the state's illegal immigrant population exploded from an estimated 88,000 to an estimated 560,000. But not on the editorial page of the New York Times. There illegal immigration is portrayed as an unappreciated blessing and Arizona as a state of racists reminiscent of the deep South at the height of the struggle for civil rights. And while there is certainly reason to criticize the mean-spiritedness of some of the state's leaders and the severity of its immigration laws, the Times has fixated on those issues while ignoring serious problems — e.g., overcrowded housing and schools, overstressed hospitals, and a general sense of disorder — that have riled the state and caused a large majority of its citizens to demand government action to stop illegal immigration. Downes's compassion for illegal immigrants is matched by his contempt for those who believe that green cards should be awarded not just on family connections to persons already here but also on an evaluation of human capital. He sees such concerns as a mask for racism. He disdains them as the direct ideological, illegitimate descendant of the spirit of the early 1900s when a federal commission used eugenics — then a fashion even among progressives — to stereotype entire populations according to their places of origin. Such pseudo-science, Downes wrote, produced "poison seeds (that) bore fruit by the early 1920s" with legislation that drastically restricted the immigration of southern and eastern Europeans. Such thinking is rooted in the righteous conviction that racism is the ultimate explanation. It allows Downes and the Times to close their eyes not only to the concerns of John Higham — the most respected chronicler of the nativism of a century ago — but of two esteemed Americans who headed commissions that examined immigration at times far more relevant to today's discussions. In its report to Congress, the Jordan Commission asserted that "it is both a right and a responsibility of a democratic society to manage immigration so that it serves the national interest. "71 This view is anathema at the New York Times editorial page, where complaints about illegal immigration are proof of racism, enforcement is unjust, and saying no is a betrayal of inclusiveness. Lawrence Downes declined a request for a meeting to talk about immigration policy. He insisted that a phone interview be off the record, except for comments about why he would not talk openly: "Because I don't think you're being fair," he said. "And I don't think you're doing it in good faith." Research into Downes's work at the Times makes it clear that he is a good and decent man, at least when he is not smearing the character and motives of those on the other side of the debate. Downes writes eloquently from a deep well of feeling. But his bias is so strong that he is incapable of acknowledging legitimate arguments on the other side. He is so enthralled with the benefits of contemporary immigration that its costs escape his notice. Downes's orientation fits a category of moral reasoning described by Jonathan Haidt, the psychology professor and author of The Righteous Mind: Why Good People are Divided by Politics and Religion.76 Haidt writes that human beings are inclined to form moral communities around belief in certain values that are so strong that they not only bind the group, but blind it to evidence from others. "If you sacralize these groups, it binds you together to fight for them," he writes.78 He adds this: "Follow the sacredness. Once you sacralize something, you become blind to evidence." And not far behind the blindness, he says, is demonization of those who disagree. Downes's tendency to demonize those who resist illegal immigration is even more problematic when it leads him to blatant distortion. Consider the "editorial observer" piece Downes wrote in 2007 under the headline "Showdown in Phoenix, Where Mariachis and Minutemen Collide. "79 It was an almost cartoonishly distorted melodrama, with stereotypical heroes and villains. But Downes was entirely earnest and deadly serious. He presented the story as a tale of "America unraveling" in a face-off in the parking lot of Pruitt's furniture store. On one side of Downes's stage were mariachis and "children dancing in Mexican folk costume." On the other side were Minutemen and "white racists." In the middle was notorious Maricopa County sheriff Joe Arpaio. The bias of his piece becomes apparent with a look at other news sources, particularly the Arizona Republic, which offered a nuanced view of the opposing sides. As Republic columnist Laurie Roberts told the story, the trouble began "when day laborers began gathering in front of (the) store, making customers uncomfortable and leaving trash in their wake. "80 That prompted store owner Roger Sensing to seek help from the sheriff's office, whose officers not only shielded customers from angry protestors, but also arrested illegal immigrants. The leader of the Downes good guys, immigration activist Salvador Reza, got all the good lines. Said Reza of the illegal immigrants: "They actually are people with a work ethic that would make the Puritans proud." Downes gave Sensing no lines at all, just this indirect quotation: "Sensing says he needs armed officers to protect customers from jornaleros" (day laborers). Downes shot down that claim in the next sentence: "Mr. Reza calls that ridiculous." Downes described the "racists" trying to drown out the music of three balladeers, with shouts of "Born in the U.S.A! K.K.K! Viva la Migra!"" He said they yearned "for a new era, when the Mexicans disappear and everything gets pure and legal again." Roberts found decent people with respectable concerns on both sides of the story. Said one of those who were invisible to Downes, "Not one of these people is against immigration. We have laws in this country, bud. There's a proper way to enter this country." Downes drew a provocative portrait of decency versus bigotry. For Downes, the story encapsulated the entire immigration debate in Arizona. Sensing and his supporters were sneering symbols of the state's psychosis. Downes sees no such humanizing detail, not in Phoenix, not anywhere where the intensity of illegal immigration has stirred the backlash that the Times once warned against. His vision is skewed. His impressions are indelible. What happened in Phoenix, like what is happening across Arizona and across the United States, is far more complex than Downes believes. It is also more worthy of fair-minded observation and commentary than has been provided by our most influential newspaper, Arthur Sulzberger's New York Times. 1 "A Civil Debate," March 27, 2006. 2 Anna Gorman, Michelle Keller, and Kelly-Anne Suarez, "The State; Many Stories, a Single Theme," March 26, 2006. 3 Ruben Navarrette, "Student protesters have a lot to learn," The San Diego Union-Tribune, April 2, 2006. 4 "We've Lost Control of Our Borders," August 2, 1981. 5 "Time to Turn the Illegal Tide," February 21, 1983. 6 "The Immigration Deal," May 20, 2007. 7 "Migrants' Freedom Ride," July 29, 2012. 8 Lawrence Downes, "One Hundred Years of Multitude," Editorial Observer, March 26, 2011. 9 "New Hope on Immigration," November 18, 2012. 10 Ed Koch, "The New York Times Editorial of November 18th on Immigration Reform Is a Disgrace," Huffington Post, November 19, 2012. 11 Daniel Okrent, "Is The New York Times a Liberal Newspaper," July 25, 2004. 12 WSJ editorial page editor Paul Gigot quoted in: Jason DeParle, "An A-to-Z Book of Conservatism Now Weighs In," The New York Times, June 21, 2006. 13 Cafaro email to Kammer, October, 2012. 14 Immigration and the Missing Nail," March 1, 1981, unsigned editorial later submitted as part of Rosenthal's Pulitzer entry. 15 Harold Evans, "Character Counts," Los Angeles Times, September 26, 1999. 16 Susan E. Tifft and Alex S. Jones, The Trust: The Private and Powerful Family Behind the New York Times, New York: Back Bay Books, 1999, p. 421. 17 Statement on Outward Bound homepage. 18 The Trust, p. 549. 19 Mark Bowden, "The Inheritance," Vanity Fair, May 2009. 20 The Trust, p. 499. 21 The Trust, p. 616. 22 Bowden, "The Inheritance," op.cit. 23 See video of the Sulzberger commencement speech. 24 The Trust, p. 651. 25 "The Times Appoints A.O. Sulzberger Jr. Assistant publisher," The New York Times, January 11, 1987. 26 The Trust, p. 616. 27 The Trust, p. 635. 29 Ken Auletta, "The Inheritance," The New Yorker, December 19, 2005. 30 Ken Auletta, Backstory: Inside the Business of News, New York: The Penguin Press, 2003, p. 144. 31 The Trust, p. 649. 35 The Trust, p. 672. 36 Wayne Robins, "Howell Raines: 'Aggressive', 'Gifted', 'Thoughtful,'" Editor and Publisher, May 28, 2001. 37 Paul Starobin, "Raines's Reign: Thunder at The Times," National Journal, April 24, 1993. 39 Ken Auletta, "The Howell Doctrine," The New Yorker, June 10, 2002. 40 Paul Starobin, op. cit. 41 Howard Kurtz:"Tough Talk at The Times," The Washington Post, May 10, 1993. 42 Max Frankel, The Times of My Life and My Life with the Times, New York: Random House, 1999, p. 392. 43 The Trust, p. 665. 45 The Trust, p. 667. 46 David Brooks, "The Next Culture War," June 12, 2007. 47 John Higham, "Another Look at Nativism," Catholic Historical Review, 44:2 (July 1958), p. 149. 48 "The Immigration Deal," May 20, 2007. 49 "Make a Bad Bill Better," May 29, 2007. 50 "Debate meets reality; Immigration," May 19, 2007. 51 David Brooks, "America's Admissions System," May 22, 2007. 53 "The Immigration Deal," May 20, 2007. 54 "Make a Bad Bill Better," May 29, 2007. 55 Charles Babington, "Bid to scrap temporary worker program is immigration bill's first test," Associated Press, May 22, 2007. 56 Paul Krugman, "North of the Border," May 27, 2006. 57 Robert Samuelson, " On Senate Bill, Selective Journalism," New York Sun, May 31, 2006. 58 "Immigration Reform and Hard Times," April 14, 2009. 59 Lawrence Downes, "For Obama, Estranged in a Strange land, Aloha Had Its Limits," April 9, 2007. 60 Lawrence Downes, "Notes from the Immigration Battlefield," March 19, 2009. 61 Lawrence Downes, "Day Laborers, Silent and Despised, Find Their Voice," July 10, 2006. 62 "So Much for the Nativists," October 27, 2011. 63 Bernstein letter to the editor, May 29, 2007. 64 "Angry Arizona, Again," February 27, 2011. 65 Office of Policy and Planning, U.S. Immigration and Naturalization Service, "Estimates of the Unauthorized Immigrant Population Residing in the United States: 1990 to 2000." 66 Michael Hoefer, Nancy Rytina, ann Bryan C. Baker, "Estimates of the Unauthorized Immigrant Population Residing in the United States: January 2008," Office of Immigration Statistics, 2009. 67 Kelefa Sanneh, "Raging Arizona; How a border state became a battleground," The New Yorker, May 28, 2012. 68 Lawrence Downes, "One Hundred Years of Multitude," March 26, 2011. 69 The Rev. Theodore Hesburgh, excerpt from a report by the Select Commission on Immigration and Refugee Policy," November 13, 1980. 70 Steve McGonigle, "Panel offer steps to curb immigration," Dallas Morning News, October 1, 1994. 71 "U.S. Immigration Policy: Restoring Credibility," 1994 report to Congress of the U.S. Commission on Immigration Reform, U.S. Government Printing Office; from the Executive Summary. 72 "Trust but E-Verify," May 30, 2011. 73 "Immigration and the Campaign," February 21, 2012. 74 The Caucus Blog, "Arizona Republican Debate Fact Check," February 22, 2012. 75 Ashley Pettus, "End of the Melting Pot? The new wave of immigrants presents new challenges?" Harvard Magazine, May-June 2007. 76 Jonathan Haidt, The Righteous Mind, New York: Pantheon Books, 2012. 77 Haidt interview with Bill Moyers on "Moyers & Company," February 3, 2012. 79 Lawrence Downes, "Showdown in Arizona, Where Mariachis and Minutemen Collide," December 10, 2007. 80 Laurie Roberts, "Leadership still lacks in migrant fight," Arizona Republic, December 8, 2007. 81 Laurie Roberts, "Mayor absent in day-labor feud," Arizona Republic, November 7, 2007. 82 Casey Newton, "Outside Phoenix store, border debate rages on," December 9, 2007. 83 Lawrence Downes, "In Arpaio's Arizona, They Fought Back," July 22, 2012.